TS #DPharmacy Admission Notification 2018,Telangana D Pharmacy Admission Notification 2018, Two Year Diploma course in D.Pharmacy, DTE Telangana Admission Notification 2018, SBTET Admission Notification 2018. 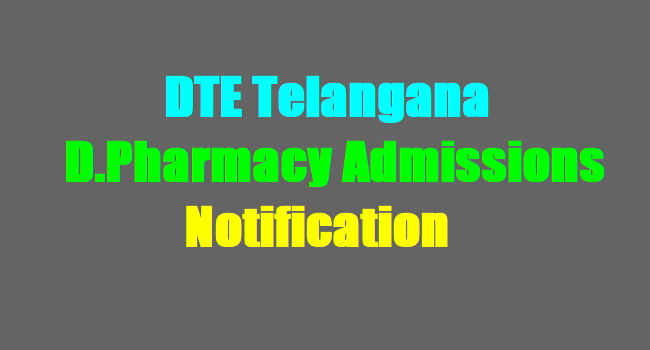 Telangana D.Pharmacy Admission Notification 2018: Government of Telangana, Department of Technical Education will give the D.Pharmacy Admission 2018 Notification on 28-05-2018 for admission into 2 year Diploma in Pharmacy Course and applications are invited from eligible candidates from the State of Telangana for admission into two year Diploma in Pharmacy (D.Pharmacy) course offered at the institutions under the control of the Department of Technical Education, Govt. of Telangana. 1. Candidates should be of Indian Nationality and shall either be a Local or Non-Local candidate defined in AP Education Institution Rules, 1974. 2. Pass in regular stream of Intermediate in Bi.P.C or M.P.C or 12 years Higher Secondary Education Boards Exam of CBSE, ICSE. 3. Qualifications obtained from Open Schools of any State /National Open Schools candidates are not eligible for admission to D.Pharmacy course. 4. Intermediate vocational course in MLT (Medical Lab Technician) and bridge course is not approved qualification for admission to Diploma course in Pharmacy. The candidates may approach the above mentioned Help-line centers (HLCs) along with a set of Xerox copies of all certificates for uploading their applications at free of cost. The HLC officials will verify the certificates, upload the data, and issue a print-out of the application. The candidates shall paste the Photograph on the application, affix signature, and enclose a Demand Draft (or pay cash, as decided by the Competent Authority) for an amount of Rs.330/- drawn in favour of the “Secretary, SBTET, Telangana., Hyderabad” payable at Hyderabad, and while enclosing a set of Xerox copies of relevant certificates, shall submit the same at the Polytechnic/Help-line centres where his/her application is uploaded. The candidate can file the application online and make the payment through the payment gateway i.e. by credit card/debit card/net banking. After making the payment get the printout of the application and receipt and enclose the photocopies of requisite certificate and send them to Secretary, State Board of Technical Education and Training, Telangana, 7th Floor, BRKR Bhavan, Near Tank Bund, Hyderabad – 500 063. The applications received without supporting documents or after the due date will summarily be rejected and the due to date for receiving the applications is 04-06-2018.
xi) The decision of Admission Officer in accepting the application of the candidate is final and no correspondence will be made in this regard. 2) Admission will be done based on the merit of marks obtained in Optional subjects of MPC or BPC out of 600 in Intermediate examination or its equivalent, as the case may be. Where there is a tie, candidate with more marks out of 1000 will be considered first and if the tie still persists, the candidate older in age will be given priority in merit. The annual fee payable by the candidate admitted into D.Pharmacy course in Polytechnics /D.Pharmacy Institutions shall be Rs. 3,800/- in case of Government and Aided Polytechnics, and Rs. 17,000/- in case of Private Un-aided D.Pharmacy Institutions. However, the fee payable shall be as fixed by the Government, from time to time, and applicable at the time of admission. 1. Commencement of submission / filing online application: 04-06-2018. 2. Last date for filling online application: 14-06-2018.